Former Dublin star dismisses Joe Brolly’s renewed criticism of Gooch. Cooper: not that type of footballer, according to Joe Brolly. FORMER DUBLIN STAR Ciarán Whelan has laughed off Joe Brolly’s latest criticism of Colm Cooper and believes that his RTÉ colleague’s comments should be taken “with a pinch of salt”. 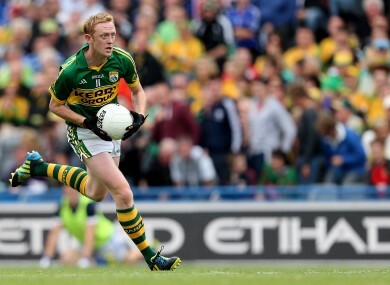 Speaking to FRQfm digital radio station, Brolly commented that the Kerry great was not putting in the “hard yards” as a centre forward and compared him unfavourably with Dublin centre half forward Ciarán Kilkenny who Brolly described as “proper”. “Cooper at centre half-forward is good in the sense that it frees him from the restrictions of the full-forward line but the problem is he’s looking for easy ball around the half-back line. “He’s not doing the primary role of a centre half-forward. If you look at a Brian McGuigan or Greg Blaney, players like that, they could also win the breaking ball, the hard yards. A centre-forward must do the hard yards and that’s just not the type of footballer Colm is. He’s looking for easy ball and it’s going to be very, very difficult for him. He [Kilkenny] is proper, he’s powerful and he’s a battler. Colm is peerless in terms of his skills but I’m on record as saying that I don’t believe he can lead a team in adversity and I’ve never seen him lead a team in adversity. Whelan however disagrees completely with Brolly’s evaluation of Cooper’s new role in the Kerry team. “To say Colm Cooper doesn’t work hard for the team is just wrong. I remember watching him against Waterford earlier this year and at one stage he was back in his own defence blocking a Waterford goal chance. He has been dropping back helping out the team all year, his work ethic has always been very good. “To compare himself and Ciarán Kilkenny as well is just wrong. They are players at different ends of the spectrum in terms of their careers. eircom, proud sponsors of the GAA Football All-Ireland Senior Championship today launched the eircom GAA Football FanPic initiative. The simple platform allows fans to search and spot themselves in a 360 degree photograph taken of the crowds at each game and then tag or share their photo via their Facebook account. Fans just need to log on to www.experiencemore/fanpic from 4.00 pm the day after each game to spot and tag themselves amongst the crowd. Email “Whelan: Cooper and Kilkenny comparison is 'ludicrous'”. Feedback on “Whelan: Cooper and Kilkenny comparison is 'ludicrous'”.